First, let's define FAILURE. We're not talking dead-end failure here. We're talking mistakes. Missteps. Speedbumps. Not achieving your goals. When we find that there are obstacles in our path, or we fall short of what what we want to do or accomplish, it provides an awesome opportunity to learn and grow. While there are some people who intentionally set out to fail so that they can embrace the opportunity to learn, most people I know prefer to achieve success as much as possible. But what happens when we're not successful? How do we go about regaining composure, accessing the motivation to continue, and learning what we can so that we can try again? "I haven't failed. I've found 10,000 ways that won't work." Many times in education, because learning is about acquiring the correct knowledge or solving a problem correctly, students and teachers feel like there's little room for error in the teaching and learning process. Teachers grapple with the idea of being a "guide on the side" rather than the expert in the room. Students settle on a grade they get on an assignment rather than using feedback to learn from their mistakes. Students worry about "looking stupid" in front of their peers. "Failure is a byproduct of pushing the envelope." "When you fail, it's not necessarily a bad thing as long as you learn from it and make something positive out of it." "The idea is that you can fail 100 times as long as you succeed once." "If you've got a boss that's telling you, 'Take a chance and if you make a mistake or fail, try not to do it again; try to learn from that.' That's a good thing." 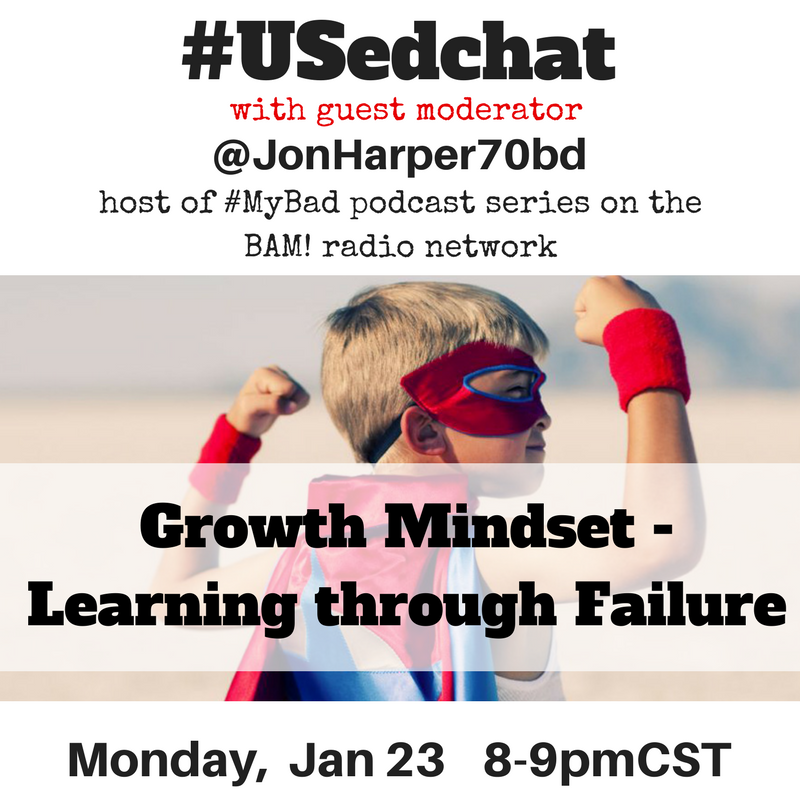 Tonight on the quarterly #USedchat on twitter, we will discuss Growth Mindset & Learning through Failure. Mistakes guru Jon Harper, the host of the My Bad podcast series on the Bam! Radio Network, will be the guest moderator for the chat. 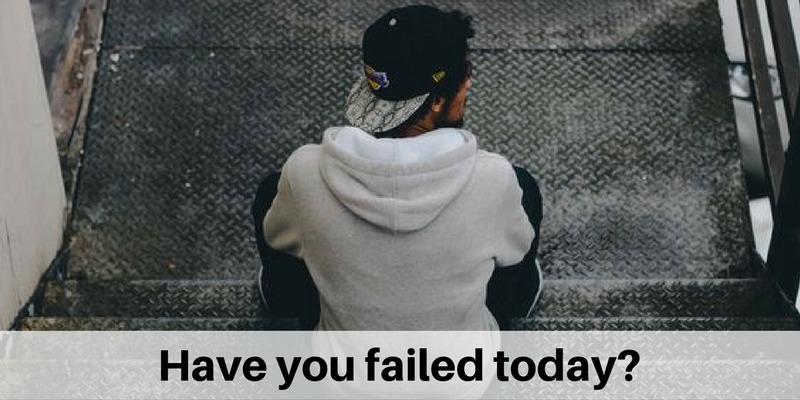 Here are some questions to inspire your own thinking about learning through failure. Actual questions will be posted during the chat. -Is learning through failure a skill that can be acquired? -For maximum learning, are taking calculated risks enough? -What did you learn from the biggest mistake you ever made? -For learning, do we treat personal mistakes the same as professional mistakes? -Are regrets the result of mistakes without learning? -What can be done to avoid failure? Should we try to avoid it? -Should we protect others from failing? -How do you help others recover/learn from failure? Everyone is welcome to join us tonight 8-9pmCST for #USedchat. We value the insights, perspectives, and experiences of those in our PLN. **Here’s a time converter to assist all of you around the globe in converting 8pm CST to your local time. Everyone is welcome. I hope you will all join us tonight for #USedchat. Motivation is important for education. Many students are not ready for simple assignments, so I use personal statement editing service at https://help.plagtracker.com/personal-statement-editing.html. Let me add that the huge number of motivational quotes is not always a great idea. People should work to achieve some goals, not less.